Actor Mohanlal was conferred with India's third-highest civilian honour, the Padma Bhushan. Actor Mohanlal was conferred with India’s third-highest civilian honour, the Padma Bhushan on Friday. The 58-year-old actor, fondly referred to as Lalettan by his fans, had won the Padma Shri in 2001. Responding to the announcement, Mohanlal thanked the government and fans for their support. The seasoned thespian is a two-time winner of the National Award for Best Actor. He won his first National Award for Best Actor for Bharatham in 1991 and the second for Vanaprastham in 1999. Mohanlal’s debut film was Thiranottam in 1978 but he got noticed with his second film Manjil Virinja Pookkal for his portrayal of the antagonist Narendran. In a prolific career spanning four decades, Mohanlal has worked in over 300 films across Malayalam, Hindi, Tamil, Telugu and Kannada films. On the work front, Mohanlal is currently busy with Lucifer and Marakkar: Arabikadalinte Simham. While Lucifer is being helmed by actor Prithviraj and it happens to be his maiden directorial, Marakkar: Arabikadalinte Simham is being directed by Priyadarshan on a big budget. Lucifer is touted to be a summer release this year and Marakkar is slated for release early next year. Congrats to one and only Lalettan, The Complete Actor. Malayalees pride. My Favourite Cricketer Gautam Gambhir Got Padmi Shri Award So Very Happy For Him, Hope Aamir Khan Gets Padma Vibhushan Award And He Becomes One Of The Rare Actors To Win All 3 Padma Awards! The second best actor ever in the Indian film industry after Kamal Haasan IMO.. Deserved one.. Lalettan.. He deserves it. 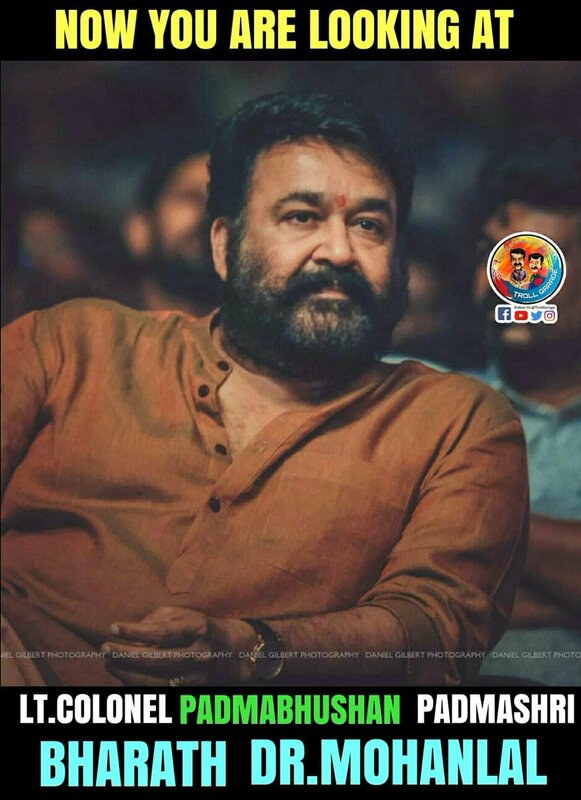 One man Industry Sri Mohan Lal Sir. Universal Star Mohanlal acquires the Kerala distribution rights of Hrithik Roshan film KAABIL for record price.